The right to use the mother tongue has been a central issue in this trial (as in other KCK trials). Its prohibition has recently led to hundreds of Kurdish prisoners joining unlimited hunger strikes in protest. Several of the hunger strikers have now reached their 58th day and are nearing death. On the 6th November we learnt that the lawyers on trial have also now joined the hunger strikes, as have another one thousand political prisoners. The defence lawyers advanced arguments for the use of the Kurdish language as a means of ending the continuing hunger strikes and saving lives. They requested the release of the prisoners, in view of the new law on mother tongue use proposed by the Minister of Justice. All these arguments were rebutted. However, the continued denial of the Court to recognise this right led to the defence lawyers walking out of the court room as a protest against the decision, and the trial halted. The Judge continued the trial without the presence of the defence lawyers, which is against Turkish law. – the lawyers were not able to see their clients, let alone speak with them, because of the ranked lines of guards standing between them to block their way. 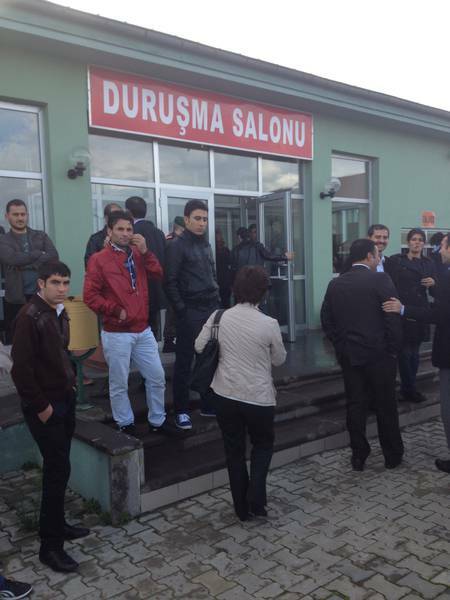 – the families of the detained lawyers were unable to attend the proceedings, because the court was too small, even though the hearing was removed to a the court room in Silivri. – when detained lawyers attempted to speak in Kurdish, the microphone was turned off. We, the international observers, express our grave concern that the Court has adjourned the trial to the 3rd January 2013. We would remind the Turkish authorities that the European Convention on Human Rights requires Turkey to come to decisions within a reasonable time frame – especially when the defendants are in detention – in order not to unnecessarily extend their custody, which, in this present case, is an extremely urgent issue since the lawyers are now on hunger strike. Our organisations express, at the close of this hearing, their deepest concern about the way the trial is proceeding, and about the total lack of respect of the fundamental guarantees of the rights of the defence. They call upon the Turkish authorities to take prompt action in order to remedy these irregularities, as well as to ensure that the internationally recognized principles of a fair trial are complied with.